Essential French Fashion and Designers: Coco Chanel, Christian Dior, Jean Paul Gaultier, Givenchy, Yves Saint Laurent, Et. Al. Gabrielle Coco Chanel is the creator of world famous fashion house of Chanel. She started her career by making hats but quickly added clothing to her portfolio. Today, Chanel is owned by Alain and Gerard Wertheimer and has Karl Lagerfeld as the head designer and creative director. 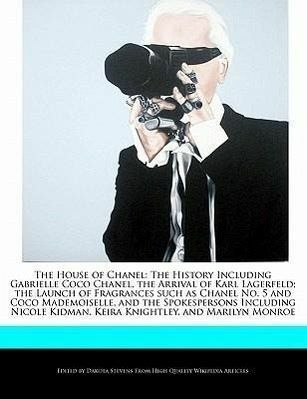 The book also discusses the spokesmodels mainly for Chanel No. 5 and Coco Mademoiselle. Spokespersons include Catherine Deneuve, Nicole Kidman, Audrey Tautou, Keira Knightley, and Marilyn Monroe.Project Webster represents a new publishing paradigm, allowing disparate content sources to be curated into cohesive, relevant, and informative books. To date, this content has been curated from Wikipedia articles and images under Creative Commons licensing, although as Project Webster continues to increase in scope and dimension, more licensed and public domain content is being added. We believe books such as this represent a new and exciting lexicon in the sharing of human knowledge.